Rates vary depending on the number of participants and the length of program chosen. We offer programs that range from 2-8 hours. In addition, our staff can travel to you for on-site specific programs. We also offer catering options for groups wanting to add lunch to their package. For a group to participate in the high course experience we require a minimum of 8 people. Our TCA programs can accommodate between 6-100. Non-profit pricing is available. 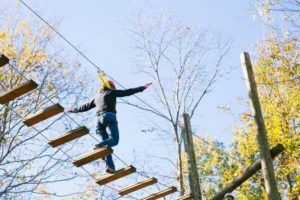 Our low ropes course includes games, field initiatives, and obstacle course type elements that focus on leadership, trust, communication, cooperation, conflict resolution and problem-solving. Our high ropes course consists of six elements that were designed for both individual and group-oriented participation. Those not actively climbing are still able to be involved in the challenge experience as active encouragers and observers.